The leftovers from a broader Gueuze-like blending session, transformed with apricot. 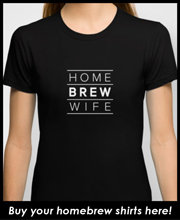 Over the course of three years, I brewed three different three-gallon batches of sour lambic-like beer that were ultimately further split into single-gallon vessels and fermented individually with a total of nine different mixed cultures. The end goal of this process was to select the best five gallons of beer and blend out a classic version of Belgian Gueuze-style beer. While I was pretty happy with how the base blend turned out, I was left with an additional four gallons of beer that was less than stellar. The primary fault in these beers was that I dramatically over-hopped the early batches with roughly 1 oz. / gallon of aged Cascade hops. Even though these hops were declared to have 0% alpha acid by the vendor whom I purchased them from, they still managed to impart a fair amount of bitterness and astringency. I have since read accounts from other brewers, including Jester King, who relayed similar stories about the dosing rates of aged hops in their early spontaneous beer experiments. According to Jester King’s blog, they currently use approximately 1lb. / barrel (0.5 oz. / gallon) of aged hops in their spontaneous beers. Rather than toss the beer outright, I opted to rack the best three gallons into a new vessel and have it go through a secondary fermentation on three pounds of apricot puree. This was allowed to ferment for another four months before being packaged and bottle conditioned. Overripe, juicy apricot is the primary aroma component, although there are some low, funky Brett aromatics that are somewhat grassy and hay-like. For being such a complex aged beer, the nose is rather simple, but still inviting. Malt character is almost nonexistent though there is a touch of light crackery malt. 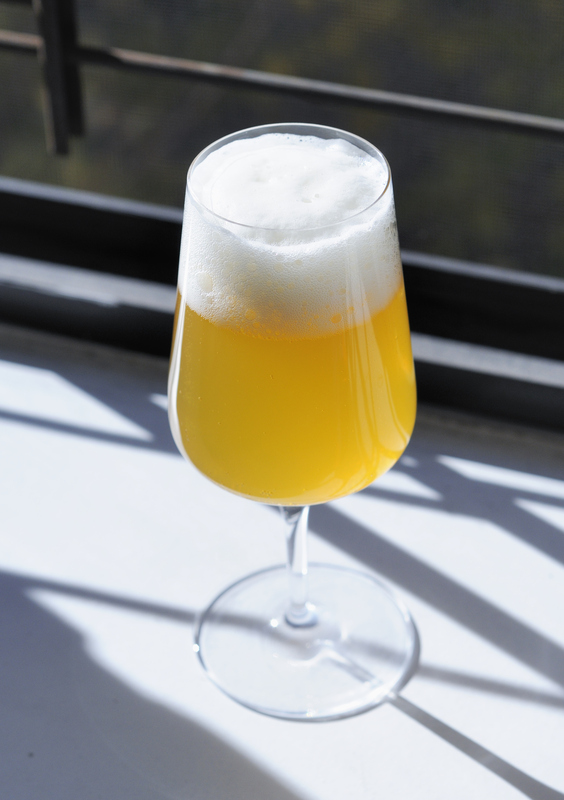 The beer pours a hazy gold with a bright white, tightly bubbled and persistent foam. Juicy apricot flesh is supported and enhanced by a medium-plus lactic acidity and sourness. There is an unfortunate bitterness and slight astringency that comes off somewhat harsh against the acid. The finish has a touch of an odd, somewhat metallic flavor that is hard to put a descriptor on. Brett funk is pretty demure on the palate and only comes off as a bit of earthy grass with the slightest whisper of plastic. The malt manages to be a touch bready and soft. The beer has a medium body with fairly low levels of carbonation. More fizz would help lift the beer off the palate and, perhaps, allow a little more complexity to pop on the aroma. There is a tannic astringency that is not particularly pleasant. Given that the origins of this beer was the rejected blending components from my gueuze blending session, I am happy that the beer retains a level of drinkability that wasn’t present in the individual blending components. The apricot has helped to soften the harsh bitterness and tannin from the original beers; although, not to the point where it isn’t a distraction on the palate. My hope is that as this beer continues to age, some of the harshness will mellow. Time will tell. 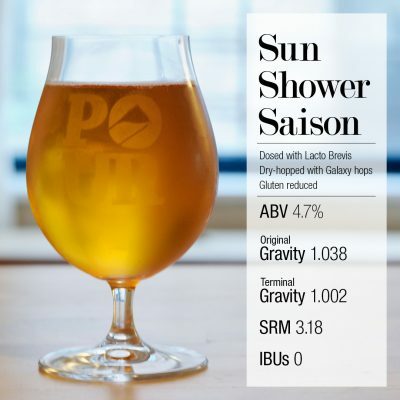 Mixed-culture Saison – Hops vs. Lacto! 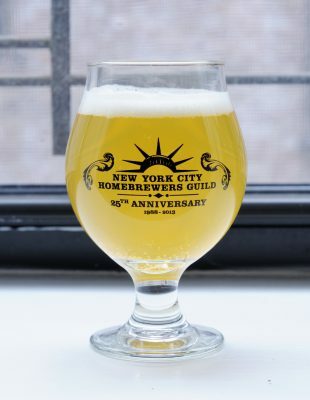 Great head retention, on this beautiful golden saison. I’ve had a lot of fun over the past couple of years maintaining a mixed culture of Sacc, Brett, and Lacto; and using it to make some pretty nice tart, funky saisons. 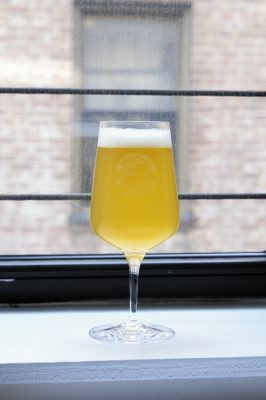 The culture started its life as a blend of cultures grown from Saison DuPont bottles, The Yeast Bay’s Amalgamation Brett Blend, and White Labs Lacto Brevis. Over the 6+ generations I’ve used the culture, it continues to produce great beers that have an awesome Brett fruitiness that plays especially nicely with big punchy dry hops. Initially, I was very concerned that too much drift would occur in the blend of different organisms, but the culture has remained remarkably consistent in its fermentation characteristics—something I hope stays true for many more generations. One thing that I’ve always known is that this mixed culture reacts differently to varying levels of kettle hopping, especially in terms of lactic acid production. I’ve observed this anecdotally over several batches, but never completed a side-by-side experiment. For fun, I decided to actually test the culture on two very similar worts to see just how different the beers would become. For starters, I used the hoppy saison recipe that has turned out quite good in the past. Two identical batches using the above recipe were brewed back-to-back. The key difference is that Batch 1 received hopping at the end of the boil in the whirlpool, whereas Batch 2 did not and was instead given a post-fermentation dry hop. Other analytic differences between the two batches are outlined below. Both batches of beer turned out extremely unique (and quite delicious). I am guessing most people would be surprised to find out that the two beers were produced from the same mixed culture and remarkably similar recipes. As expected, the whirlpool hopped beer developed significantly less acidity than the batch that was not hopped prior to fermentation. Tasting the beers, it is very obvious that the beer that did not receive kettle hopping is significantly more sour than the beer that was hopped in the whirlpool. That said, the whirlpool hopped beer did develop a light lactic tartness that is consistent with its 3.27 finishing pH. It is also interesting to note that the kettle-hopped beer attenuated slightly less than the beer that only received a dry hop. I would have thought the opposite would have occurred with the lower pH inhibiting attenuation by the Brett / Sacc in the culture. The difference of .02 SG is probably not significant enough to draw any real conclusions, but it is an interesting anecdote. The sensory aspects of the two beers are strikingly different. The beer that received kettle hopping ultimately developed a much higher level of the traditional flavors attributable to the Brett in the mixed culture (funk, overripe fruit) whereas the Lacto-heavy dry-hopped beer is much more two note with lots of acid and a significant fruity, dry hop character. 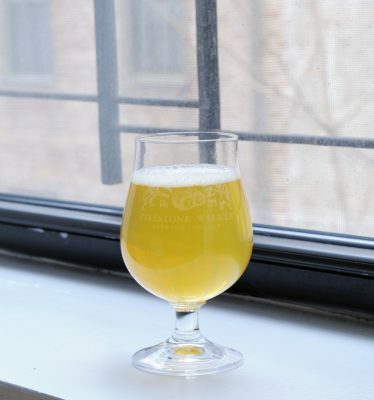 It is unclear to me why the kettle-hopped beer developed more Brett character and it will be interesting to see if the dry-hopped beer eventually develops these characteristics. I hope to keep some of the beer around to see if the flavors ultimately converge at a single point or whether they continue to remain two incredibly different beers. UPDATE: The dry-hopped version of this beer placed first in Category 28, American Wild Ale at the 2016 Joint Novembeerfest / Puget Sound Pro-Am. Peppery with a hint of ham (reminiscent of the carved ham station at King’s Table Buffet). When fresh, the Galaxy hops bring a nice melon (mainly cantaloupe) flavor. Yellow-to-gold range (if there are any designers reading this, think PMS 7405). Relatively clear, but with very poor head retention. Peppery spiciness with melon and a touch of salt. A subtle hint of barnyard funk and tartness. Very light body with seltzer-like qualities. Could afford to be more carbonated. If I had set out to brew non-alcoholic water, I’d be ecstatic! But as it stands, I’m satisfied that my first beer came out without any major flaws. Beer Description: Ultra low alcohol (3.0%) saison. Minimal malt, light fruity hop character, soft lacto sourness. Dry, crisp, effervescent, quenching. A whisper of sulfury egg hits the nose first, but blows off quickly and is followed by a fairly prominent Belgian yeast note featuring some light peppery phenol, a touch of clove, and a subdued generic fruitiness. There is a touch of yogurt-like lacto and some soft hop aromatics reminiscent of mango, citrus, and perhaps a touch of pineapple and honeydew melon. The nose is subtle, but nuanced. Pale gold with a light haze. A low white head forms, but quickly dissipates under a crackle of soda pop like fizziness. No retention whatsoever. There is a soft bready malt flavor that is quickly underscored by a fairly expressive peppery yeast character. The beer is somewhat tart, although much less so than I would have expected given the pH tested at 3.14 prior to pitching Saccharomyces. The beer is bone dry. The hop flavor is generally fruity and citrusy, which plays nice with the acidity in the beer. There is no hop bitterness. The beer gives an impression of mineral water with an almost seltzer-like finish. Extremely low-bodied with spritzy carbonation. There is a slightly astringent tannin present. The beer is very quenching, although perhaps a bit watery. This is a nice refreshing beer. I think to be on target with the recipe’s design intent it needs a bit more tartness and residual body to make it more sessionable and expressive.